Happy Tuesday ❤︎ It’s been a really long time since I’ve written a “favorites” post and I’ve been collecting some awesome blog posts over the last month or so. Before I get into blog posts, here are some recent tangible favorites! Can you tell I’m 100% in vacation-mode? Ha. Lisa posted this a while ago, but it’s always relevant to celebrate and acknowledge the mommies in your life and around the community. I love Lindsay’s “To Do List for a Better Week“! There are at least 4 things here I should try! I’ve never been through anything like this, but Chelsea does an amazing job talking about her breastfeeding experience and the struggles that come with nourishing a baby. We should all aspire to encourage and build communities like Alexandra’s. There’s no room for hate or intolerance. Weed that crap out! My sister-in-law Christina turned 26 in June and shared 26 life lessons! Guys… Chelsea’s amazing reminder about being proud of yourself is something we all need to read! What are some recent favorites- online and off- that you’ve discovered lately?? *Totally forgot about the link-up with Lauren & Bre! Counting this as an ‘Add It To My List’ post!! They’re kind of weird and super heavy in the beach bag… but they look cool 😉 That’s what matters, right?? Ha! Thanks for sharing my post, sweet friend! Going to check out the others now. No prob! Thank you for writing it!! This is so fun to find new blogs!! Thanks! Glad I could direct you to some 🙂 You’re welcome! 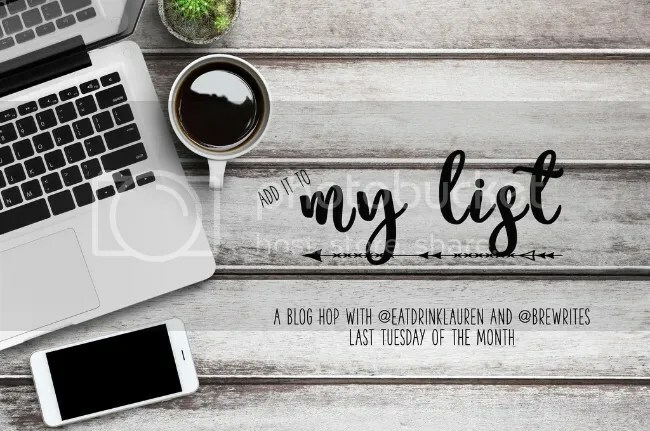 Great links – I love the To Do List for a Better Week! I LOVE it. I’ve been using it at the beach and I haven’t run out of water while down in the sand once! It’s perfect!! I don’t think I’ve read any of those posts. Will definitely check them out and appreciate the recommendations! Yay! Glad I could suggest a few for ya! No problem! I love that circle towel – I might have to grab one for our next beach trip. Thank you! It’s kind of heavy, but it was too adorable to pass up! I have a Bubba tumbler at work and I love it! I do wish the bendy straw was a little taller though! I agree with you- the straw is a little short… But it’s huge and it saves me trips to refill my water constantly!! Haha! No joke, today I was going to end my post asking for people to share blog posts to check out so I am so glad you did that! I see those circle towels everywhere and they’re so cute that I wish I could justify one but I bought a cute picnic blanket last year… that I have only used once. So sad. Thanks for linking up! I haven’t used my circle towel to dry off yet… I’ve just used it on the ground or sand while at the beach. I’m not sure how it actually hold up as a towel. Lol! I’m glad I was on the same page with blog recommendations! Hope you enjoy them!! Your post was great!! I loved it! Lindsay seriously hit the nail on the head with that one. Hope you liked it!! Great links! A lot of my favorite bloggers aren’t posting much lately, so definitely looking for new reads. 😛 On To-Do List for a Better Week, at first I thought novelty floats meant like ice cream floats, and I was on board with that but then I realized she meant floaty toys and I got really excited. I saw a family at the beach once who had a giant orca raft and it was amazing!!! I need to go see how much that costs. Glad I could suggest some! (I usually forget to copy down the links to posts I loved.) Lindsay is a HUGE fan of the pool floats, lol! I’d advocate for rootbeer floats, though- go get yourself one!! Hahahaha- definitely don’t mind all the comments 🙂 I’m so glad you wrote that post. I think it was really important, relatable information. Your story was definitely one that needed to be shared and connected with! Lindsay and Chelsea always write posts exactly when I need to hear them!!!! And breastfeeding is in one of the most frustrating things I’ve ever went through. Lindsay and Chelsea are word-wizards. Seriously, I love their writing voice. Chelsea’s story on breastfeeding is so eye-opening and important. In a world where the pressure is HIGH to be the best mom doing the “best” things for their child, the need to connect with and relate to others is so so strong! It just made me so, so angry! HOW DARE some people, you know? I’m glad you used your words to share the story and express the true values that make your town (and life) so precious and special.